Russian literature refers to the literature of Russia or its émigrés, and to the Russian-language literature of several independent nations once a part of what was historically Russia or the Soviet Union. Prior to the Nineteenth Century the seeds of the Russian literary tradition were sown by the poets, playwrights and writers as Derzhavin, Fonvizin, Sumarokov, Trediakovsky, Karamzin and Krylov. From around the 1830s Russian literature underwent an astounding golden age, beginning with the poet and novelist Aleksandr Pushkin and culminating in two of the greatest novelists in world literature, Leo Tolstoy and Fyodor Dostoevsky, and the short story writer and playwright Anton Chekhov. In the Twentieth Century leading figures of Russian literature included internationally recognised poets such as Vladimir Mayakovsky, Boris Pasternak, Anna Akhmatova and Joseph Brodsky, and prose writers Maxim Gorky, Vladimir Nabokov, Mikhail Sholokhov, Mikhail Bulgakov and Aleksandr Solzhenitsyn. Old Russian literature consists of several masterpieces written in the Old Russian language (not to be confused with the contemporaneous Church Slavonic). Anonymous works of this nature include The Tale of Igor's Campaign (Слово о Полку Игореве, Slovo o Polku Igoreve) and the Praying of Daniel the Immured (Моление Даниила Заточника, or Moleniye Daniila Zatochnika). The so-called жития святых (zhitiya svyatikh, lives of the saints) formed a popular genre of the Old Russian literature. The Life of Alexander Nevsky (Житие Александра Невского, or Zhitiye Aleksandra Nevskovo) offers a well-known example. Other Russian literary monuments include Zadonschina, Physiologist, Synopsis and A Journey Beyond the Three Seas. Bylinas – oral folk epics – fused Christian and pagan traditions. Medieval Russian literature had an overwhelmingly religious character and used an adapted form of the Church Slavonic language with many South Slavic elements. The first work in colloquial Russian, the autobiography of arch priest Avvakum, emerged only in the mid-17th century. The "Westernization" of Russia, commonly associated with Peter the Great and Catherine the Great, coincided with a reform of the Russian alphabet and increased tolerance of the idea of employing the popular language for general literary purposes. Authors like Antioch Kantemir, Vasily Trediakovsky, and Mikhail Lomonosov in the earlier 18th century paved the way for poets like Derzhavin, playwrights like Sumarokov and Fonvizin, and prose writers like Radishchev and Karamzin, the later is often credited with creation of modern Russian literary language. The 19th century is traditionally referred to as the "Golden Era" of Russian literature. Romanticism permitted a flowering of especially poetic talent: the names of Zhukovsky and later that of his protegé Aleksandr Pushkin came to the fore. Pushkin is credited with both crystallizing the literary Russian language and introducing a new level of artistry to Russian literature. His best-known work is a novel in verse, Eugene Onegin. An entire new generation of poets including Mikhail Lermontov, Evgeny Baratynsky, Konstantin Batyushkov, Nikolai Alekseevich Nekrasov, Aleksey Konstantinovich Tolstoy, Fyodor Tyutchev, and Afanasij Fet followed in Pushkin's steps. Prose was flourishing as well. The first great Russian novelist was Nikolai Gogol. Then came Leskov, Ivan Turgenev, Saltykov-Shchedrin and Goncharov. Then, Leo Tolstoy and Fyodor Dostoevsky, who soon became internationally renowned to the point that many scholars have described one or the other as the greatest novelist ever. In the second half of the century Anton Chekhov excelled in writing short stories and became perhaps the leading dramatist internationally of his period. Other important nineteenth-century developments included Ivan Krylov the fabulist; non-fiction writers such as Belinsky and Herzen; playwrights such as Griboedov and Ostrovsky and Kozma Prutkov (a collective pen name) the satirist. The beginning of the 20th century ranks as the Silver Age of Russian poetry. Well-known poets of the period include: Alexander Blok, Sergei Esenin, Valery Bryusov, Konstantin Balmont, Mikhail Kuzmin, Igor Severyanin, Sasha Cherny, Nikolay Gumilyov, Maximilian Voloshin, Innokenty Annensky, Zinaida Gippius. The poets most often associated with the "Silver Age" are Anna Akhmatova, Marina Tsvetaeva, Osip Mandelstam and Boris Pasternak. While the Silver Age is considered as the development of the 19th century Russian literature tradition, some avant-garde poets tried to overturn it: Velimir Khlebnikov, David Burlyuk, Aleksei Kruchenykh and Vladimir Mayakovsky. Though the Silver Age is famous mostly for its poetry, it gave some first-rate novelists and short-story writers, such as Alexander Kuprin, Nobel Prize winner Ivan Bunin, Leonid Andreyev, Fedor Sologub, Aleksey Remizov, Yevgeny Zamyatin, Dmitry Merezhkovsky and Andrei Bely, though most of them wrote poetry as well as prose. The first years of the Soviet regime were marked by the proliferation of avant-garde literature groups. One of the most important was the Oberiu movement that included Nikolay Zabolotsky, Alexander Vvedensky, Konstantin Vaginov and the most famous Russian absurdist Daniil Kharms. Other famous authors experimenting with language were Ilya Ilf and Evgeny Petrov, Andrei Platonov, Mikhail Zoschenko, Yuri Olesha and Isaac Babel. But soon Sovietization of the country brought Sovietization of the literature. Socialist realism became the only officially approved style. Novelists Maxim Gorky, Nobel Prize winner Mikhail Sholokhov, and Aleksei Nikolaevich Tolstoi; and poets Konstantin Simonov and Aleksandr Tvardovsky were the most prominent representatives of the official Soviet literature. Only a few, such as Ilf and Petrov, with their picaresque novels about a charismatic con artist Ostap Bender, could publish without strictly following the Socialist realism guidelines. Many writers wished to resist official ideology. Mikhail Bulgakov, author of The Master and Margarita, and Boris Pasternak with his novel Doctor Zhivago continued the classical tradition of Russian literature with little hope of being published. The Serapion Brothers insisted on the right to write independently of political ideology: this brought them into conflict with the government. Meanwhile, émigré writers, such as poets Georgy Ivanov, Georgy Adamov and Vladislav Khodasevich; and novelists such as Ivan Bunin, Gaito Gazdanov, Mark Aldanov and Vladimir Nabokov, continued to flourish in exile. In post-Stalin Russia, Socialist realism remained the only permitted style, and while some good authors such as Yury Trifonov managed to make it through censorship barriers, most, like Nobel Prize winner Aleksandr Solzhenitsyn (who built his works on the legacy of the gulag camps), or Vasily Grossman couldn't publish their major works in the USSR. The authorities tried to control Russian literature even abroad: for example, they put pressure on the Nobel Prize committee to deny Konstantin Paustovsky the Literature Prize in 1965. The prize was awarded instead to Mikhail Sholokhov who was more loyal to the Soviet regime. Pasternak was forced to refuse his Nobel Prize in 1958. Post-Communist Russia saw most of these works be published and become a part of mainstream culture. However, even before the decay of the Soviet Union, tolerance to non-mainstream art had slowly started to grow, especially during the Khrushchev Thaw. Some works of Bulgakov, Solzhenitsyn and Varlam Shalamov were published in the 1960s. The decade brought out new popular authors, such as Strugatsky brothers who disguised Social criticism as Science fiction. Poetry became a mass cultural phenomenon: Yevgeny Yevtushenko, Andrey Voznesensky, Robert Rozhdestvensky and Bella Akhmadulina read their poems in stadiums and attracted huge crowds. But the thaw didn't last long. In the 1970s, some of the most prominent authors were not only banned from publishing, but were also prosecuted for their Anti-Soviet sentiments or parasitism. Solzhenitsyn was expelled from the country. Leaders of the younger generation, such as Nobel prize winning poet Joseph Brodsky, novelists Vasily Aksenov, Eduard Limonov and Sasha Sokolov, short story writer Sergei Dovlatov, had to emigrate to the US, while Venedikt Erofeyev "emigrated" to alcoholism. They remained known in the Soviet Union with the help of samizdat. The only relatively independent prose that could be published during this period of time was the Village Prose, whose most prominent representatives were Viktor Astafiyev and Valentin Rasputin. Soviet Union produced a large amount of Science fiction literature, inspired by the country's space pioneering. Early science fiction authors, such as Alexander Belayev, Alexey N. Tolstoy, Alexander Kazantsev, were influenced by English writers such as Herbert Wells. But since the thaw in 1960's Soviet science fiction began to form its own style. Books of brothers Arkady and Boris Strugatsky, Kir Bulychov and Ivan Yefremov are reminiscent of social problems, utopian and distopian ideas and often include satire of contemporary soviet society. The end of the 20th century has proven a difficult period for Russian literature, with relatively few distinct voices. Among the most discussed authors of these period were novelists Victor Pelevin and Vladimir Sorokin, and the poet Dmitry Prigov. A relatively new trend in Russian literature is that female novelists such as Tatyana Tolstaya, Anya Ulinich Lyudmila Ulitskaya or Dina Rubina have come into prominence. Detective stories and thrillers have proven a very successful genre of new Russian literature: in the 90s serial detective novels by Alexandra Marinina, Polina Dashkova and Darya Dontsova were published in millions of copies. In the next decade a more "high-brow" author Boris Akunin with his series about the 19th century sleuth Erast Fandorin became widely popular. Fantasy and Science fiction literature is still among best-selling with authors like Sergey Lukyanenko, Nick Perumov and Maria Semenova. Tradition of classic Russian novel continues with such author as Mikhail Shishkin. The leading poets of the young generation are arguably Dmitry Vodennikov and Andrey Rodionov, both famous not only for their verses, but also for their ability to artistically recite them. Russian literature is not only written by Russians. In the Soviet times such popular writers as Belarusian Vasil Bykov, Kyrgyz Chinghiz Aitmatov and Abkhaz Fazil Iskander wrote some of their books in Russian. Some renowned contemporary authors writing in Russian have been born and live in Ukraine (Andrey Kurkov, Marina and Sergey Dyachenko) or Baltic States (Garros and Evdokimov). A number of prominent Russian authors such as novelists Mikhail Shishkin, Ruben Gonsales Gallego, Svetlana Martynchik and Dina Rubina, poets Alexei Tsvetkov and Bakhyt Kenjeev, though born in USSR, live and work in Europe, North America or Israel. Suffering, often as a means of redemption, is a recurrent theme in Russian literature. 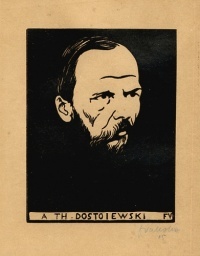 Dostoevsky in particular is noted for exploring suffering in works such as Notes from Underground and Crime and Punishment. Christianity and Christian symbolism are also important themes, notably in the works of Dostoevsky, Tolstoy and Chekhov. In the 20th century, suffering as a mechanism of evil was explored by authors such as Solzhenitsyn in The Gulag Archipelago. A leading Russian literary critic of the 20th century Viktor Shklovsky, in his book, Zoo, or Letters Not About Love, wrote, "Russian literature has a bad tradition. Russian literature is devoted to the description of unsuccessful love affairs." Unless indicated otherwise, the text in this article is either based on Wikipedia article "Russian literature" or another language Wikipedia page thereof used under the terms of the GNU Free Documentation License; or on original research by Jahsonic and friends. See Art and Popular Culture's copyright notice. This page was last modified 10:15, 12 January 2019.